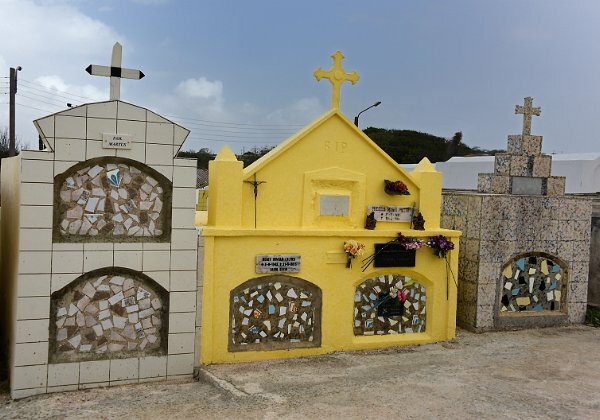 This Catholic cemetery is located in the Eastern part of the island (Banda Ariba), adjacent to the Parokia San Dominiko church.Aamong the crypts are several with half-cylinder tops. The molds for these were found in back of some crypts.At the center of the cemetery is the crypt of Monsignor Julio F. Henriquez (1908 - 1998), topped by a tall white cross. The gate is topped by the words "Sosega Napaz" ("Rest in Peace" in Papiamento). The day I photographed was overcast and rainy. Photographed July 6, 2016. Copyright (c) 2019 J.A. Maass.